iMacsoft DVD to Apple TV Suite for Mac is an all-in-one Mac DVD to Apple TV Converter and Mac Apple TV Video Converter suite especially designed for Mac OS users to rip DVD to Apple TV and convert video to Apple TV with excellent quality. iMacsoft DVD to Apple TV Suite for Mac includes two professional products: DVD to Apple TV Converter for Mac and Apple TV Video Converter for Mac. iMacsoft DVD to Apple TV Converter for Mac is a professional Mac DVD to Apple TV converter, which can help you convert DVD to Apple TV MPEG-4, H.264 video formats and Apple TV MP3, AAC, WAV audio formats, play DVD movie on Apple TV with super high speed and excellent quality! iMacsoft Apple TV Video Converter for Mac, as professional Mac Apple TV Video converter, can convert all video formats such as AVI, DivX, XviD, WMV, MPEG, DAT, VOB, RM, RMVB, MKV, FLV, SWF, MOV, ASF to Apple TV MPEG-4, H.264 video formats. Moreover, It can also convert popular audio files including WMA, MP2, OGG, RA, AC3, CDA, etc. to Apple TV MP3, AAC audio formats with high conversion speed and excellent quality..
Now free download and try this powerful iMacsoft DVD to Apple TV Suite for Mac and enjoy your favorite movie clips on Apple TV with full HD quality. The converted video and audio files can be played on different multimedia devices like iPad, Apple TV, iPod classic, iPod nano, iPod touch, iPhone 3G, iPhone 3GS, iPhone 4, etc. iMacsoft DVD to Apple TV Converter for Mac, professional Mac DVD to Apple TV converter, can helps you convert DVD to Apple TV MPEG-4, H.264 video formats and Apple TV MP3, AAC, WAV audio formats, put DVD on Apple TV with super high speed and excellent image and sound quality! 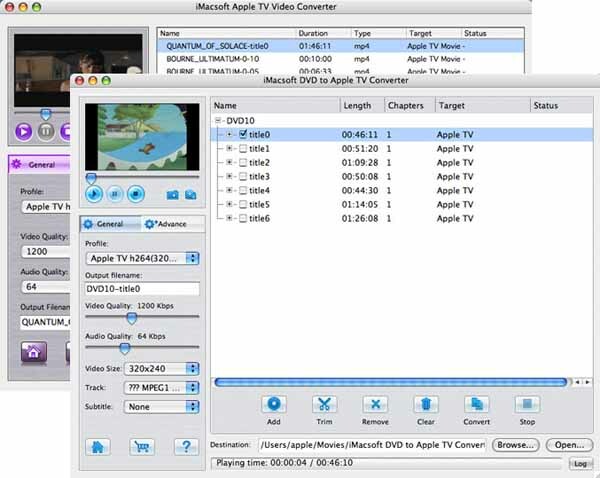 iMacsoft Apple TV Video Converter for Mac, professional Mac Apple TV Video converter, can convert most popular videos such as AVI, DivX, XviD, WMV, MPEG, DAT, VOB, RM, RMVB, MKV, FLV, SWF, MOV, ASF, etc. to Apple TV MPEG-4, H.264 video formats. Otherwise, iMacsoft Apple TV Video Converter for Mac can convert popular audio files including WMA, MP2, OGG, RA, AC3, CDA, etc. to Apple TV MP3, AAC audio formats.